Confidently tackle the highways of Colorado from behind the wheel of the new 2019 Mazda CX-3. Schedule a test-drive at our Mazda dealership in Lakewood, CO, and view the new Mazda CX-3 interior for yourself. We can go over the 2019 Mazda CX-3 mpg ratings and price, and help you decide if you’d like to finance the Mazda CX-3 Sport, Touring or Grand Touring trims. Learn more about the Mazda CX-3 specs, then come buy or lease the new 2019 Mazda CX-3! Cruise across Colorado in true style from behind the wheel of the new 2019 Mazda CX-3. All 2019 Mazda CX-3 trims are outfitted with a SKYACTIV®-G 2.0-liter engine that pumps out 148 horsepower, and is paired with a SKYACTIV®-Drive six-speed automatic transmission with manual-shift and sport modes that provide smooth shifting around every turn. Tour Lakewood with complete confidence thanks to i-ACTIV AWD®, and you’ll be happy that all-wheel-drive technology is available regardless of if you buy a Mazda CX-3 Sport, Mazda CX-3 Touring or Mazda CX-3 Grand Touring trim. Interested in scheduling a Mazda CX-3 test-drive? 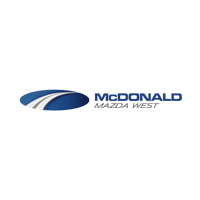 Visit McDonald Mazda West to finance the 2019 Mazda CX-3 Sport, Touring or Grand Touring. We look forward to helping you buy or lease the new 2019 Mazda CX-3 at our Lakewood Mazda dealer!